From 1955 to 1961 the world championship was awarded to manufacturers based on the results of five or six major races. The top class was ususally made of open-top front-engined race cars ("barchettas"). This includes the Jaguar C & D-types, Ferrari Testarossa, and Maserati Tipo 61. There were always GT cars in these races, and while these cars were awarded class victories in the various events, there was no overall championship. It is important to note that at this same time, Formula 1 was in its 1.5 litre era. While there were some very good 1.5L cars and drivers, the overall spectacle was diminished. Sportscars took advantage of this situation and brought back some of the excitement. The Italian 1:43 diecast industry took a major step forward in the mid 1980's with the launch of the first "Box" Model, item #8401. 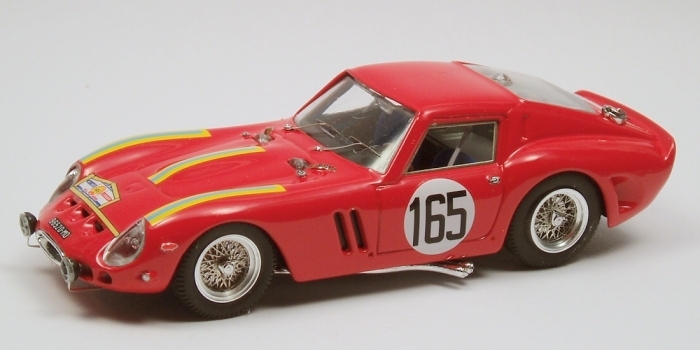 This series of GTO's listed below were issued with race-authentic factory-applied decals. This was a major advance from the Solido and Vitesse products, which were shipped as blank cars with a decal sheet. The package was originally all paper and cardboard, but a plastic case was later deveoped. This same case is used to this day by "Best" model. The "Box" line of GTO's includes many notable World Chanpionship apperances, including the debut class win by the NART team at Sebring 1962. After Box Model split, Bang issued more usits from the 8400 Box series above, but renumbered them as the '400' series. These were identical to the Box Model versions, and all had the plastic case that Box model had been using. Around 2005, Bang re-designed the detailing but retained the same casting. These improved Bang models feature photo-etched wheels and windshield wipers, and come in a larger box. The cars that have reference numbers #7111 and higher are generally the improved versions. 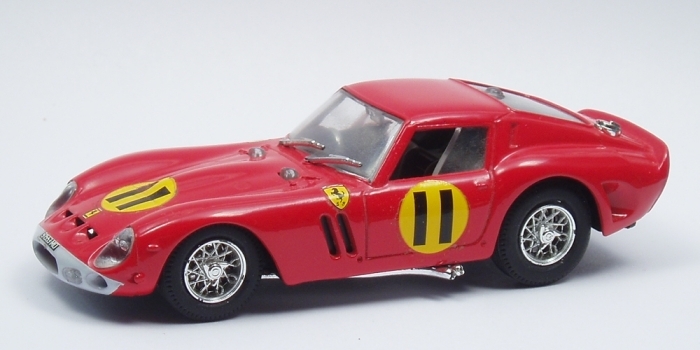 0 Ferrari 250 GTO "Ten Years Bang"